"Late Night's" Jimmy Fallon gives the best gifts. 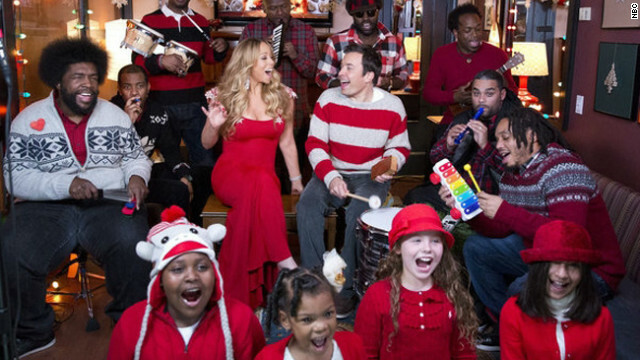 The comedian and TV host is clearly aware of the nation's weakness for Mariah Carey's holiday classic, "All I Want for Christmas Is You," and thus collaborated with the songstress and The Roots on a special rendition for his show on Tuesday. But instead of the typical equipment we see used on Fallon's show, the crew sat down to perform with instruments you'd find in a kid's toy box. A recorder, a wood block, a tambourine, a Fisher Price xylophone, bongos and a kazoo were among the instruments used for the festive performance. Carey nailed her performance note for note, and was backed up by her band and an adorable kid quartet. Between this and DMX's "Rudolph the Red-Nosed Reindeer," we eagerly await the next holiday song remix to add to our playlist. i love her dress she's look great....her breasts are also holding up well. The Roots playing those instruments and the kids singing made the whole thing for me. Good to see Mimi's voice is still working. Fallon's a creep, though. he would to – you are awesome. No kidding, look at the curves on her, wowzers! I love Jimmy Fallon's show. it was alot of fun....jimmy fallon is so funny.